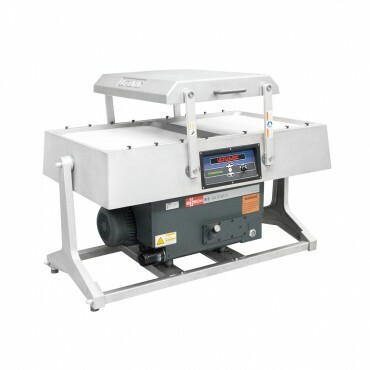 Whether it's meat, poultry, cheese, fish, seafood, or produce that you need to preserve, the Ultravac 2100 dual chamber vacuum packaging machine is the most dependable, simple to own, simple to operate in the marketplace. 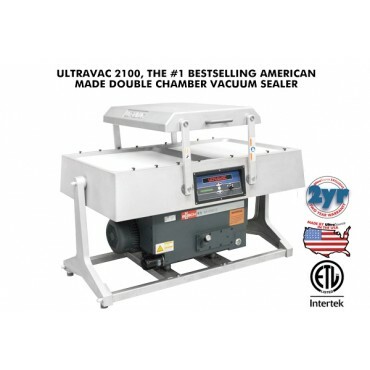 With twin vacuum chambers, the Ultravac 2100 can help boost your production. 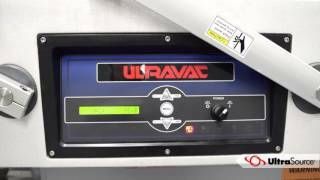 See the Ultravac 2100 Double Chamber Vacuum Packaging Sealer in action! The Ultravac 2100 is available in two different sizes, 8” or 12” chamber depths, and several pump and chamber configurations to meet your specific production needs. All machines are equipped with air-cooled rugged vacuum pumps. The 8” model is available with a 5 (NEW! ), 7.5, 10, or 12-hp pump. 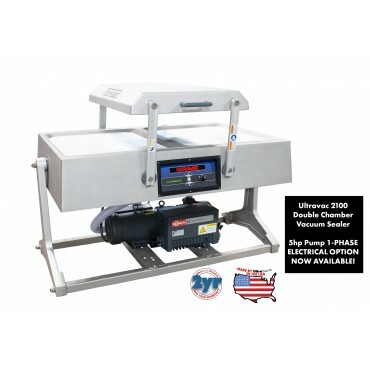 For larger sized products like hams, turkeys, large primal cuts, or cheese blocks, the 12” chamber depth is recommended and comes equipped with a 10-hp or 12-hp pump. NEW! Single Phase Power Option - 5hp Vacuum Pump Equipped Ultravac 2100! 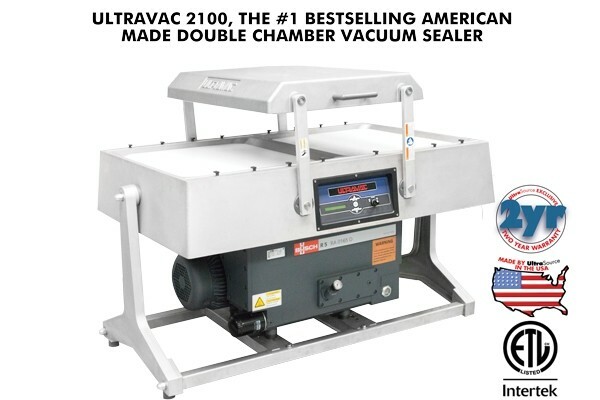 Call 800.777.5624 or message us now to learn why the Ultravac 2100 is the #1 USA Made double chamber vacuum sealing machine and be sure to ask about 0% financing for up to 36 months for qualified buyers! UltraSource is a leader in vacuum chamber packaging. The Ultravac 2100 Double Chamber Vacuum Sealer is legendary for its durability and performance. The Ultravac 2100 chamber is widely used in the packaging industry and is known as a workhouse. It is not uncommon to see well maintained UV2100 machines operating at peak performance after 10 or more years. The Ultravac 2100 is made with solid cast aluminum lid and body, which are incredibly strong. The UV2100 is also equipped with the best vacuum pump available on the market from Busch® and reliable digital controls. The Ultravac 2100 double chamber vacuum sealer is easy to operate and enables companies to quickly package small, medium and large size products. You can adjust the chamber depth by adding or removing plastic plates that come with the machine. 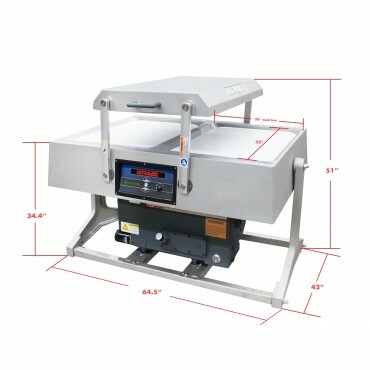 If you intend to package very large items, you might consider upgrading from the 8” lid to the 12” lid that provides more sealing room for large hams, turkeys, cheese blocks, briskets, and other big products. 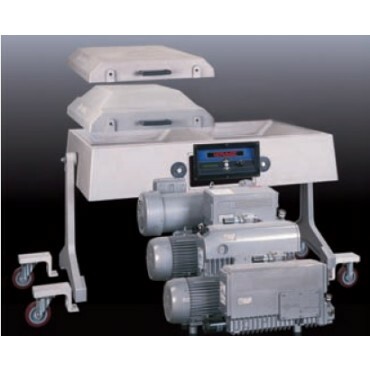 The 2100 is a great choice for companies that have larger production needs but are not quite ready for a thermoforming, rollstock packaging machine or if you want to supplement a packaging line with something that can vacuum seal larger profile products like large hams, turkey, poultry, and large cheese blocks or wheels. The number of products that you can seal on an Ultravac 2100 depends on the size of the products, the type of sealing you are doing, and the speed and number of your employees. There is 53” of seal bar space on each chamber side (two 26.5” seal bars per side that are 32” apart) and the sealing capacity depends on how many bags you can get in the chamber. If you are using 6”x8” bags, you could load 8 vacuum bags in one chamber, four 6” wide bags on each seal bar. The vacuum cycle time depends on what level of vacuum you are applying and whether you are using gas. When you use gas flush, the cycle time increases. A typical configuration will allow you to complete about 2 cycles per minute. So, in the example above with 6”x8” vacuum bags, you could potentially seal 16 bags per minute. The speed of your team in loading and unloading the machine will also be a factor in your production rate. Another consideration is how you will label your chamber vacuum sealed products. UltraSource offers a variety of labeling machines that provide versatility, accuracy, and speed in product labeling. We have manual, electronic label dispensers, automatic top and bottom label dispensers and weigh price labeling solutions. Another option is to order custom printed bags with your branding and product information. 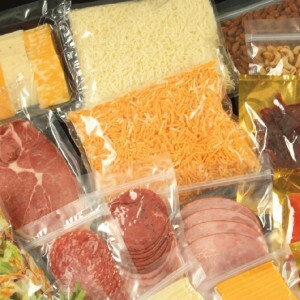 UltraSource offers a wide selection of chamber vacuum sealing pouches. Choose from 3 mil, 4 mil, and 5 mil vacuum pouches in a large variety of size dimensions. We can even work with you on creating a custom size for your business. 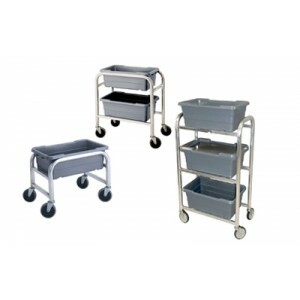 A custom size has minimum order size requirements, call for more information. Other bag options include black and gold foil bags. Our foil bags have a clear plastic front and an opaque gold or black foil backing. The black and gold foil chamber vacuum pouches are popular around the holidays and for products that customers want to stand out in a display case. Re-sealable zipper chamber vacuum pouches are another popular retail display chamber vacuum pouch. We have high barrier EVOH bags that are black with a clear display window. The high barrier chamber vacuum EVOH bags are excellent for vacuum sealing beef and other jerky products. Lastly, UltraSource supplies vacuum packaging shrink bags and shrink dip tanks and tunnels. Click for information on selecting chamber vacuum pouch sizes. 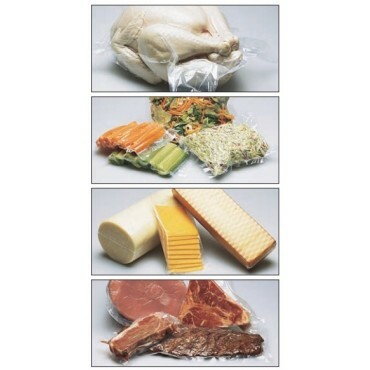 Ultravac chamber vacuum sealers are built for robust commercial use, unlike home food sealers. Ultravac commercial chamber vacuum sealers are superior to other industrial chamber vacuum sealers because of their design, construction, premium components and proven history in tough meat, dairy, poultry, and other production environments. UltraSource is a pioneer in vacuum chamber packaging and the Ultravac machines are trusted for their reliability and performance. All UltraSource vacuum chamber machines are HACCP compliant as long as vacuum packaging, also known as Reduced Oxygen Packaging (ROP) is identified as a critical control point in your HACCP plan and the plan documents the controls for Clostridium botulinum and Listeria monocytogenes. UltraSource also has a readily available supply of commercial chamber vacuum sealer parts, packaging supplies, and service expertise to help ensure you get the maximum performance from your chamber vacuum sealer. Experienced expert Ultravac service technicians can be reached Monday thru Friday 8:00 am to 5:00 pm Central time for questions you may have about your Ultravac chamber vacuum sealer. There is no charge to talk with a technician and or your account manager for support. -Gas Flush: The Gas Flush option allows the operator to introduce an inert gas into the chamber after the vacuum stage. This option can be used as a filler to prevent crushing of the product after sealing, as a means to prolong shelf life or as a means to maintain desirable product appearance. -Double Seam Seal: All machines are equipped with standard seal bars having a single seal element per seal bar. The Double Seam seal bars have two seal elements per seal bar. A double seam seal bar helps to achieve consistent and long-lasting airtight seals. 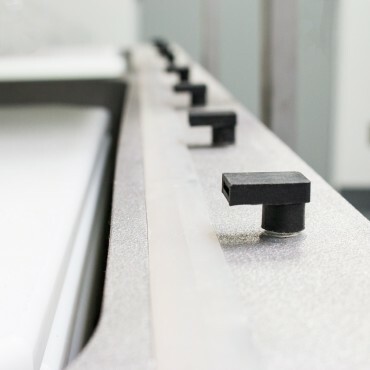 We strongly recommend using air-assisted sealing with this option to achieve the best results. -10mm Wide Seal: 10mm Wide Seam Seal Option - The 10mm Wide Seam option seal bars provides an extra strong and wide chamber vacuum pouch seal. It is required to use air-assisted sealing with this option to achieve the best results. -Perforating Knife: Perforating knives are used to facilitate the removal of excess pouch material. Perforating knives are not intended to cut pouches off completely, only to perforate so that excess material can be easily removed by hand. This can help expedite the trimming of excess materials and improve the bag appearance. -Precut Knife Options: The precut option is a patented system designed by UltraSource to increase the versatility of the Ultravac® 2100. This option increases the speed in which this machine can be loaded with product. The user simply places the pouch full of product into the machine and pulls it close to the seal bar allowing the excess material to hang on the outside of the machine. Not only does this increase the loading speed, but it also improves the appearance of the final product. The precut option also allows the end user to stock fewer sizes of pouches because excess pouch material is trimmed away. When using this option, the bag or pouch containing product is placed inside the machine as usual. However, rather than having to carefully tuck the bag inside the slot in the machine before closing the lid, the open end of the bag is placed outside the machine by simply draping the bag over the side of the machine. When the lid is closed, the seal bar is brought down and the special precut blade cuts evacuation slits in the bag or pouch, which allow the air inside the bag to escape during the normal evacuation process. UltraSource has a warehouse of high-quality vacuum chamber packaging machine parts including vacuum pump oil, oil filters, air filters, chamber vacuum seal bar Teflon tape, vacuum seal bars elements, chamber vacuum sealer lid springs, lid gaskets vacuum sealer control panels, replacement control panel buttons, and much more.Shop online and do not hesitate to contact our expert Parts and Service teams for assistance. The Ultravac 2100 is backed by a 2-year warranty, which covers the major machine components like the pump, chassis and electronic components. Talk to an account manager for more details about the warranty. 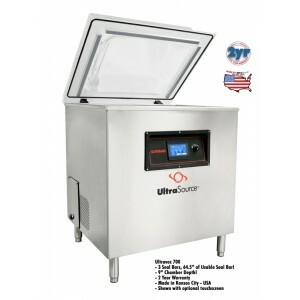 The Ultravac 2100 double chamber vacuum sealer is a smart investment for your business. The machine can help boost your production immediately and provide many years of service. USA based customers can qualify with a 3rd party financing firm for 0% financing for 36 months on the Ultravac 2100 or other UltraSource double chamber vacuum sealers. This offer cannot be combined with other offers. Contact UltraSource today at 800-777-5624 or message us to learn how an Ultravac 2100 double chamber vacuum sealer can help you increase production efficiencies, minimize rework, extend shelf life, and improve package quality.